Lechal is among the latest in wearable technology. With its GPS backing Lechal doubles up as a navigation tech as well as fitness tracker. 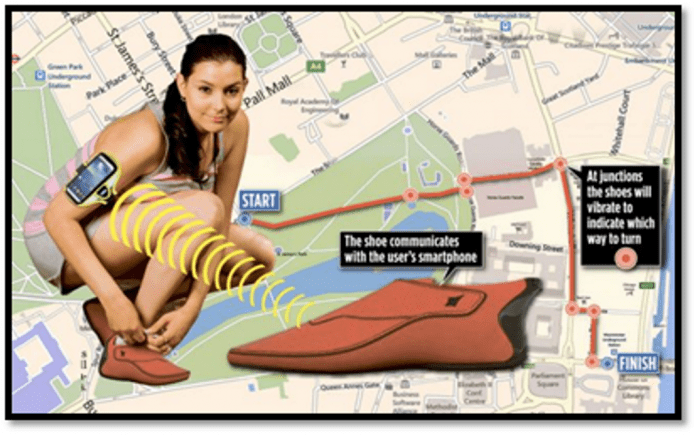 The technology comprises of two pods usable with your shoes with the means of insoles slipped into the shoes. These insoles communicate with the wearer by the means of vibrations. Taking you in the right direction and becoming an important part of your life. Here is the promise of the Lechal technology. It stands for ensuring that you spend less time staring at your phone, and more time enjoying the world around you when you navigate those cool passages. The Indian company Ducere Technologies has brought this hands free eyes free navigation technology to the world of travel gadgets. Lechal is their claim to success. Available in two forms, one is a pair of buckles for external use on top of the shoe and the other is a pair of insoles that go into a pair of shoes of your choice. Lechal connects to its app through Bluetooth and relays a haptic feedback to prompt the user. The app uses GPS and Google maps to help the user navigate. This invisible wearable technology makes use of lithium-polymer batteries that among the new gadgets is the only one capable of up to 15 days of heavy-duty use on a single charge. A very helpful feature that Lechal brings to the hiker in you is its offline function. This function allows the device to function in the offline mode as well as it does when there is connectivity. This makes each place in the world a traveller’s delight. There is also a tagging feature that enables the wearer to tag any place of interest. Even trails that are not on conventional maps can be tagged using single tap of the toe. This tagged place is stored in the app’s data bank and recalled whenever it is re-visited. Besides helping the user get to the destination, Lechal is highly capable among the league of high-end cool gadgets. For instance, Lechal can double up as a fitness tracker and map marker. The only time the phone screen comes into action is when the user sets direction or checks out a place of interest. The settings allow even this basic function to be set to the user voice command, making this navigation gadget invisible to everything around it. Besides, the app allows the Lechal wearer to connect with other Lechal wearers and synchronize there location in real time. Enjoy Lechal pod insoles or lace up the buckle in the shoelace, making it one of the best navigation gadgets for men and women. Navigate hands-free without having to look at your phone screen. Read route guides in detail through a variety of vibration patterns. Track your state of fitness based on steps taken, calories burnt, and distance travelled. Enjoy Lechal pod insoles or lace up the buckle in the shoelace. Soft-soled leather and easy-care microfiber based insoles. Use the app that serves as the fitness tracker as well. What else, Bluetooth connectivity allows your shoes to let you know if you are at the risk of losing your phone. Works offline anytime, anywhere in the world. Lechal also has the alert feature in case you accidentally leave your phone behind. Therefore, you do not have to keep checking for your phone when you are out enjoying the sightseeing trip. A great feature is the gesture control. With this feature, wearers will have the ability to use gestures such as tilting the foot for tagging locations. A milestone in smart navigation, Lechal will tag for you anything that interests you in your sightseeing journey. These are locations tagged for later use, with easy sharing via the net with friends. It could even be the new trail you have discovered, that you can record for future excursions. The insoles are powered for a straight 15 day use. This is done by a rechargeable battery that goes into the very back of the insole or behind the heel of the shoes. Lechal is an important move in the world of wearable navigation because of its hands-free and eyes-free feature. Lechal is highly advanced in its intuitive bearings, and is successful in guiding people across hikes, excursions, commutes around the world.